Understanding how the 5-way switch on a guitar works will help you in wiring your guitar. 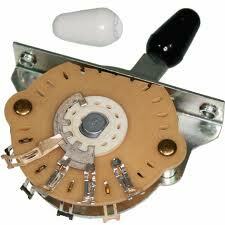 There are two common types of 5-way selector switches in the guitar world, the Fender type and the “import” type. Both of these are functionally identical but are different in physical layout. You can easily identify which type you’re dealing with. 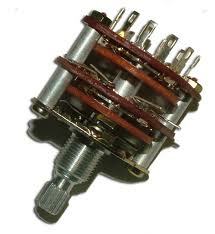 The Fender-type switch (when viewed from below) have two rows of 4 contacts on the circular body of the switch, and the import-type switch has a single row of 8 contacts. Most Fender-type switches are usually found in Fender guitars, but are easily available so they could find their way into any guitar. There are a lot of Strat-styled guitars and the Fender switch might find its way into any of them. There is also a rotary 5 way switch, but I have never seen one actually working in a guitar, But if you wired one in, it would work. A 5-way switch is actually a place where connections are relayed from one place to another.They are mechanically connected within the assembly. 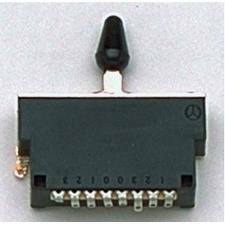 The contacts are connected and disconnected by the lever of the component. Of course you can feel free to express yourself and try different ways to wire it. You may just find something you like. The original Fender Stratocaster had 2-pole 3-way switches and were intended to only select the neck, middle or bridge pickup. When the switch was moved from one position to the next, the last contact was made before the next contact was broken. People found that if you could position the switch in between the three positions, you could actually have both the neck and middle, or middle and bridge pickups connected at the same time! It became common to rest the 3-way switch in between the positions; so common in fact that in the 60’s people were filing notches in the detente mechanism of the 3-way switch to achieve that in between position. These became the “notch” positions. In the 70’s, Fender adopted this popular switching style in their stock switch thus becoming what we now use and call a “5-way” switch. Before you begin, remember that the Fender-type and import-type switches are functionally identical. The only difference is in the physical layout of the contacts. The schematics are the same for both switches, but the switches are different as you can see by the photos. The schematics might be labeled 1, 3, and 5 (with 2 and 4 being the in-betweens) or they might be labeled B, M, and N (which stands for Bridge, Middle and Neck). The best way of working out which contact is which is by using a multimeter and see for yourself which contacts as you sweep the switch through the 5 positions. On the Fender-type and some import-type switches you can see which contact is are being made. If the switch is open or see through, you will be able to see which contacts are being made by the wiper. This method of visualizing the switch also helps when it comes time to oriented the switch in the right direction. I have an upcoming section on wiring schematics and doing the actual soldering that might be helpful. I will provide the links here once it’s done. I hope this was informative and helped you out. If you have any comments or questions, please feel free to ask. You’ve given me some great ideas from your article|post|details. I’d love|like to see this happen in real life|world! No dramas mate. im thkining about buying a set of these pickups for my 67 reissue strat, any chance you could do a review/demo on them for me, though a solid state amp on the chean channel deminstraing just how noiseless they actuly are? big ask i know, but there doesnt seem to be many good reviews on youtube, most guys are either running them through tube amps, adding wads of gain, or just flat out cant plan, i think i could hear what i need to through your playing. I believe I can, just let me know what pickups you would like for me to review.